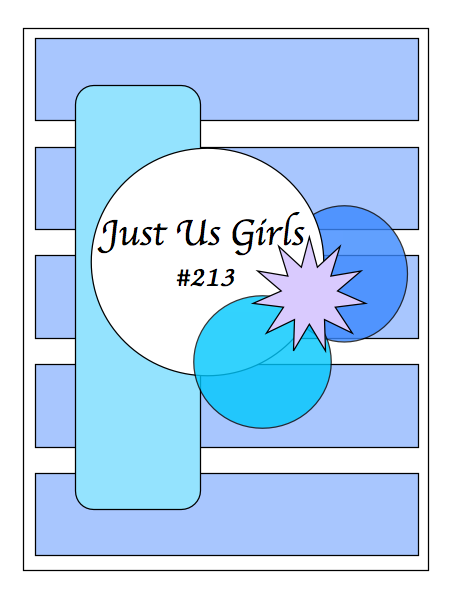 This week over at JUGS, Sharyn is are fabulous hostess! She came up with a fantastic sketch for us this time to get us started! I only made 4 back panels instead of 5…..OOPS!!!! GEEZ Nanc’!!! My double stick tape is like super glue so there was no going back! I hope I am forgiven when you see my card! I must say the Summer Silhouettes Stamp set from Stampin Up…just might be my favorite SU set ever! It’s my go to set…that is for sure! Her card was my inspiration!!! I linked up her blog for you, so go have a looksie! out there in blogland that inspire me and keep me motivated in this wonderful craft! Who knows….YOU could be next! I think it’s such a compliment to someone if you CASE their work….don’t you agree? I loved this panel so much that I thought it would be fun to create more then one! The banner die cut and the sentiment is from Verve. All the ink is also Stampin UP along with the scalloped punch. I drew the vase myself and I think the rest is self explanatory. talented teammates have done with this sketch! Categories: Cards | Tags: Card making, Cards, friends, rubber stamps, sketch challenge, sketches, Stamping Up, Thinking of you, Verve Stamps | Permalink. Love how colorful this is! You did the sketch proud too! So pretty (even with only four panels instead of five…LOL!). Beautiful card! Beautiful card Nancy. Love how you did the panels and the pretty colors. I thought they were patterned paper at first. Fabulous job. Fun inspired card — and YES I am hugely complimented when I inspire someone! I love your card Nancy, so bright and fun. I take inspiration from you all the time, your cards are amazing, and now thanks to you I am following Amy’s blog too, and yes it is wonderful when someone takes inspiration from something you have done, a true compliment. What a fantastic sketch! Your card is just beautiful! 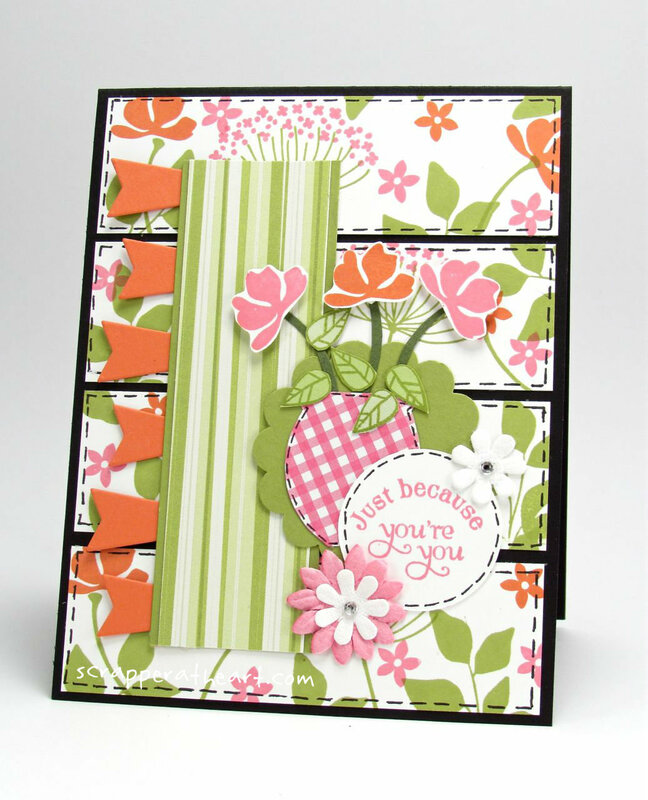 Nancy, what a fun card this is with the gorgeous colors and flowers. I’m really loving that orange die cut. Is that from Verve? I agree with Marisa. What a way to bring a breath of Spring into Fall. It really is lovely! Yes it is from Verve!! Thanks!! Nancy, this is so fun and cheerful! Love that gingham vase on the scalloped circle. I really like the addition of the little flags, too. I am glad I am not the only one who used just 4 panels. This design really pops on the black background, and I LOVE that you stamped all the PP yourself. Thanks for the kind comment on my DD-DT post! So excited! Nancy, I love your bright and beautiful card! Great use of the sketch! OMGosh, Nancy, that is something I would do! Oh Well…you card is so PRETTY, I wouldn’t change a thing! LOVE the vase in the circle and your colors~! I love this! Riotous color, pattern and oodles of layers. I LOVE IT!! !